This program, woven from music and poetry, continues Troveresse's exploration of the ties between music written in the Middle Ages and music from the oral traditions of Europe and beyond. 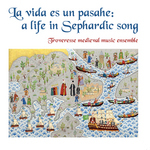 La vida presents a life, or various possibilities for life in the songs of the Sephardim. These songs, of birth and death, love and hate, joy and sorrow, loss and longing, are remarkable for their poetic and musical beauty and for what they communicate of the indomitable human spirit. All but one of the songs on this disc (Üsküdara, which is in Turkish) are in the language usually known as Ladino, a dialect of Spanish which the Sephardim retained in the new countries in which they settled after their expulsion. While the songs change as they travel, taking on musical and linguistic characteristics of their new homes, many of them retain musical and poetic links with Spain. 'Gerineldo', for instance, can be traced to a Spanish romance, 'Quién hubiese tal ventura' found in Diego Pisador's Libro de música para vihuela. Our readings are taken from other traditional Sephardic songs and from writings of the Jewish poets of medieval Spain: 'My heart is in the East' by Judah Halevi (1075?-1141? ); 'Where are the graves' by Moses Ibn Exra (1055?-1135? ); 'The hour in which I am' by Samuel Ha-Nagid (993- 1056).